2) Click on “Register” in Top of the My GyFTR website. 3) Fill up your Details like:- Name, Email, Mobile number, DOB , and Click on “Submit”. 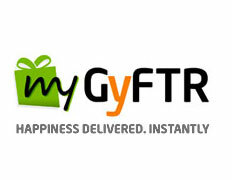 4) Now you will get 100 points in your My GyFTR wallet instantly and also you will notify via SMS. Note:- These 100 points will we redeem after your 1st Purchase on My GyFTR website via debit / credit card only, You can buy 1 Bookmyshow voucher for Rs 100 using a debit/credit card and then buy another Rs 100 Bookmyshow voucher using your points.